We have whip’d protein rich fudge into the softest protein bar we have ever made. It is low on sugar, low on carbs and low on guilt. 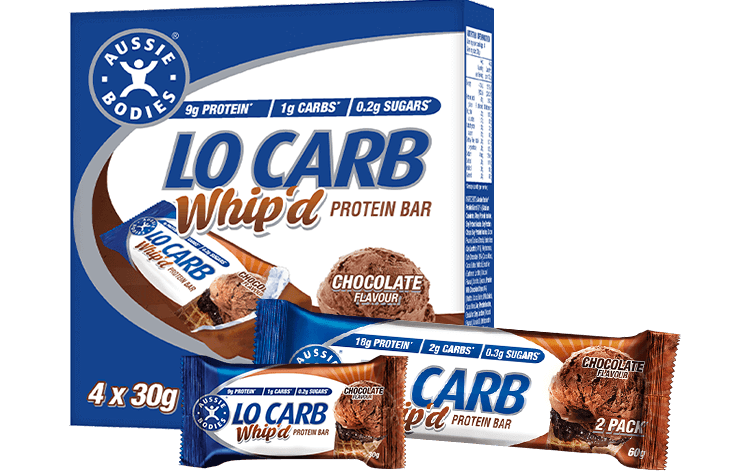 Ingredients: Aussie Bodies® Protein Blend (30%) [Calcium Caseinate, Whey Protein Isolate, Soy Protein Isolate, Soy Protein Crisps (Soy Protein Isolate, Cocoa Powder, Tapioca Starch), Emulsifiers (Soy Lecithin, 471)], Dark Chocolate (18%) [Cocoa Mass, Cocoa Butter, Maltitol, Emulsifier (Sunflower Lecithin), Natural Flavour], Polydextrose, Sorbitol, Glycerol, Protein Milk Chocolate Chips (5%) [Maltitol, Cocoa Butter, Milk Solids, Cocoa Mass, Soy Protein Isolate, Emulsifier (Soy Lecithin), Natural Flavour], Cocoa Powder, Canola Oil, Cocoa Mass, Natural Flavour, Salt, Emulsifier (Soy Lecithin).